Since changing jobs my 30 minute walk to work has been swapped with 30 minutes sitting on the bus. Not ideal as I would prefer to walk, but I’m now working in the food and drink sector which I adore, so it’s a change I am quite happily adapting to. It’s not exactly a huge commute, however I’ve got a whole hour of extra time in my day which, as it turns out, is perfect for blogging. These posts will probably be much shorter than usual, but still full of lots of yummy food and drink ideas! So, on to today’s topic… delicious smoked trout (yes that’s right, trout, not salmon!) 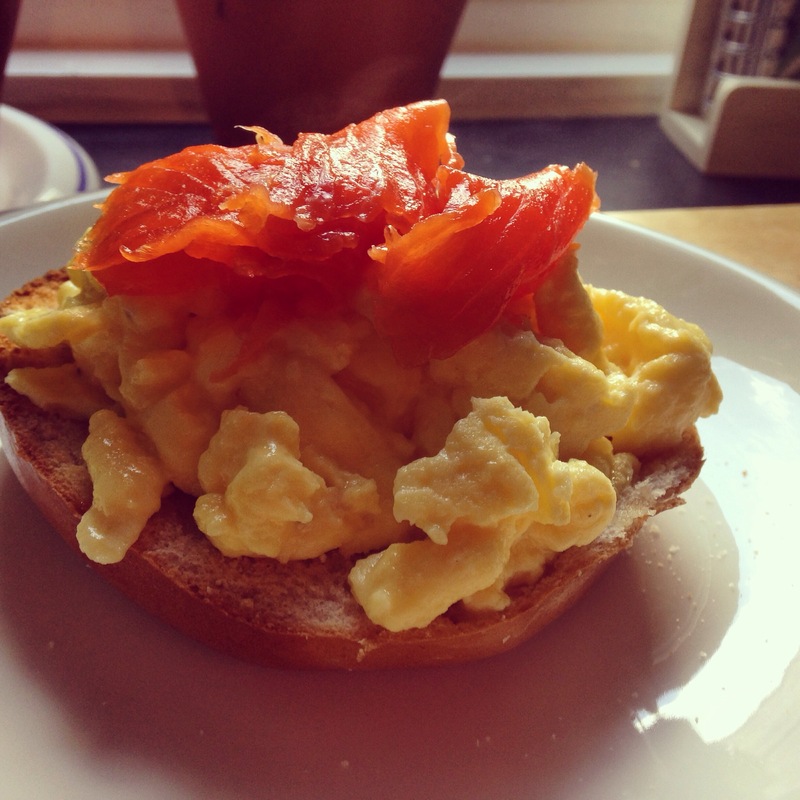 with creamy, scrambled eggs on a toasted bagel. It couldn’t be quicker or easier, but it really hits the spot on a Saturday morning. Smoked trout is a brilliant alternative to smoked salmon. 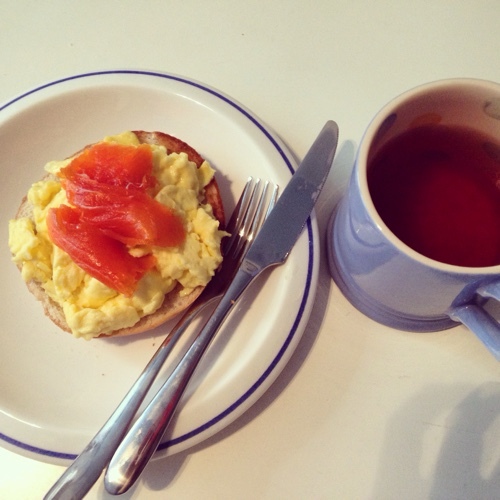 The smoked fish flavour is not quite as intense as that of smoked salmon, so for breakfast it’s perfect. 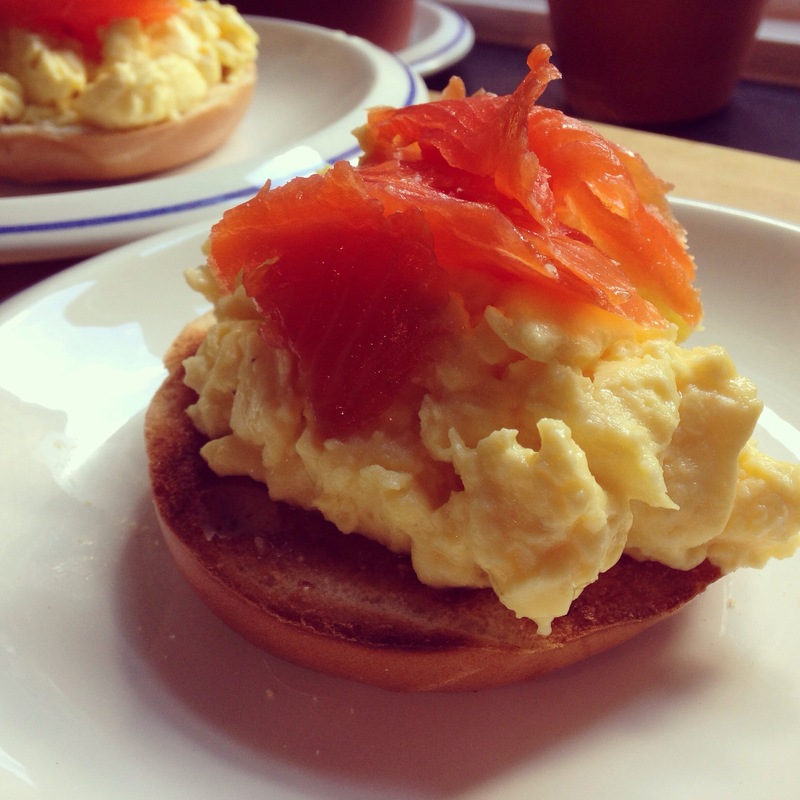 It carries all the health benefits of smoked salmon – high in Omega-3, a great source of protein and it’s low fat. For this breakfast bagel I used RR. 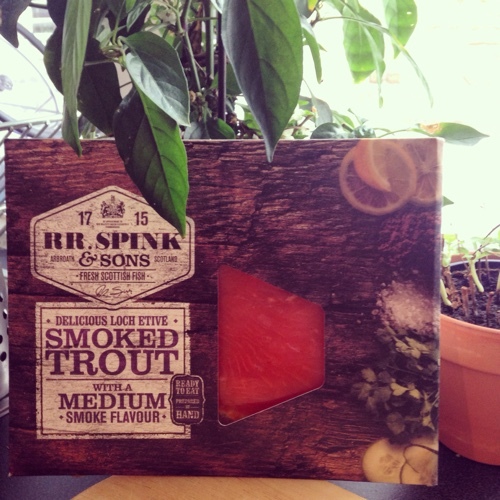 Spink & Sons Loch Etive smoked trout. If you are drawn in by the lovely package, you’ll be pleased to hear the contents don’t disappoint. But first things first, how to make the perfect scrambled eggs. Whisk 4 medium sized eggs in a bowl, add some salt and pepper and a dash of milk. If you want real luxurious eggs add a dash of cream instead of milk. Melt a reasonable sized knob of butter in your non stick frying pan. Just as the butter has all melted add the eggs to the pan. Leave for a minute to let the bottom start to cook, then using a wooden pan or plastic spatula, move the eggs around every 20 seconds or so, allowing the eggs to cook through. I like mine a little runny so I take them off the heat just as the last bits are starting to cook. Slice your bagel and pop it in the toaster. 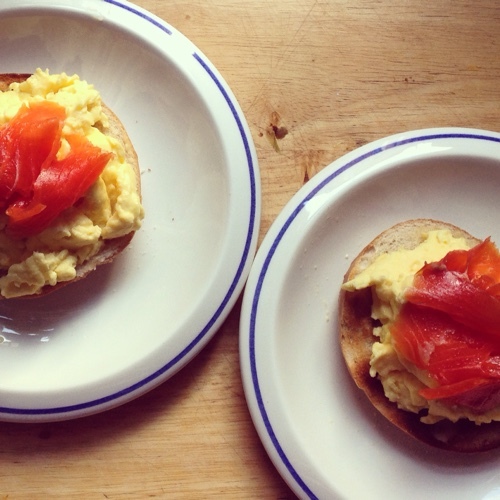 Lightly toast and then assemble your eggs and then your smoked trout on top. You might like to squeeze over a little bit of fresh lemon or crack some more pepper. Now all that’s left is to get yourself a cup of tea or coffee and tuck in. Looks delicious! What a great breakfast.